How Is the Bottom Floor of a Home Framed? First floor walls are installed. 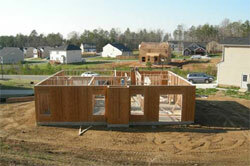 The framing process is remarkably quick with panelized construction. As you can see from the photo examples, the first floor is erected in a single day by a small team of workers. Since Ryland sells many copies of their floor plans in different communities, they can built most of the frame in house at their factory and the end result is a sturdy, well constructed and easy to assemble structure. The crews utilize pneumatic nail guns to quickly bind all of the materials together. Each section of the first floor frame fits together well and you get an immediate idea of the actual, physical layout of the house. The interior walls are also panels that are secured to the floor and the exterior walls in rapid fashion. The 2x4 construction for this floor plan features nine foot walls, as well as numerous windows, all cut out of the OSB and headed with the joists. The bottom floor of your home is the most important part of your entire house. This is because most of the support systems that you create for your house are located in this portion. Aside from that, the bottom floor also acts as the main foundation of your house and takes up most of the weight of the house. You should be aware of the parts of the bottom floor and how they are constructed. The most important part in constructing the bottom floor of a structure is to lay out a suitable foundation for your house. The foundation of your house serves as the keystone of the entire house that you are going to build. This implies that when the foundation is removed or is destroyed, your house will not stand on its own. Aside from that, this serves as the leverage of the main framing of the first floor of your house. Without this, the frame will not hold its ground for a long time. Thus, the need to constantly construct the frame may be needed when the foundation is not optimally constructed. The most common material that is used for foundations of houses is concrete. Concrete can either be poured into forms that create the walls or concrete blocks can be used. This can be used in conjunction with other frames by simply constructing the spaces where the main joints will be inserted. The main joints will serve as the prime attachment of the frames to the foundation. There are different types of joints that you may use for home construction. For the first floor of your house, it is advisable that you use complex joints. This will ensure that your foundation, along with the frames, will keep its ground for longer periods. Some of the other materials that you can use in attaching the frame to the foundation are heavy-duty glue, cement, bolts, nuts, and screws. The type of material that you will be using will also depend on the type of house that you will be constructing. Aside from this, your budget is another factor that you can look into when purchasing these materials. As for the frames, wood is used as the main material for constructing this part. However, you may also use other materials such as steel and aluminum. After laying out the foundation, placing the frames, and attaching the joints to their respective places, the next step in constructing the first floor framing is the placing of reinforcements. The reinforcements will serve as additional support for the entire construction of the frame. This is especially important for the first floor of your house because this is the where the frames take up the most amount of weight than the other frames of the house. The reinforcements will also serve to protect the main frame from immediate deterioration. Some of the materials that you can use for reinforcements are concrete, modular aluminum, and lath and plaster. These are the steps in constructing the bottom floor of your house. It is important that you familiarize yourself well with these steps for you to correctly execute them. Incorrect performance of the steps that are indicated may cause your house to have problems in the future. Problems may present in the form of presence of cracks on the wall and the corners of the house and water seeping through the walls, among other problems that you may encounter. You should carefully plan each step that you are going to take in the framing of the bottom floor of your home. If you have hired a framing crew to frame your house, they will know the correct steps to take since they are the experts. If you will be overseeing the construction, it may be a good idea to become familiar with the correct steps.